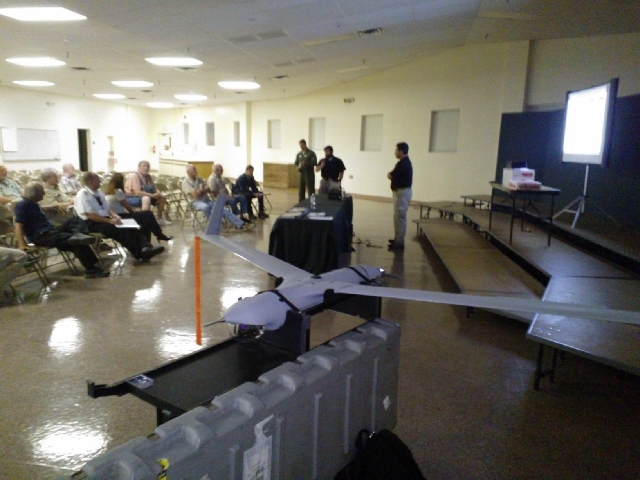 City staff, in coordination with the Nevada unmanned aircraft systems program office, hosted a public meeting Monday at the Boulder City Smith Center regarding Boulder City potentially becoming a testing area for unmanned aircraft. Last year the FAA Modernization and Reform Act of 2012 was passed by Congress, requiring the Federal Aviation Administration to integrate civil unmanned aircraft systems, or drones, into the national airspace by September 2015. Gov. Brian Sandoval’s economic development office is leading a statewide effort for Nevada to be one of six national areas selected as a test site for the integration. If Nevada’s application is approved, Boulder City will be one of the state’s three test ranges, Boulder City airport manager Kerry Ahearn said. The small group attending the meeting consisted of about 20 people and included members of the airport community, city officials and a few concerned residents. The meeting included a presentation by Boeing Co. subsidiary Insitu, which manufactures drones for the U.S. military, showing the technical aspects and potential applications of drone use. Steve Bishop, Insitu’s business development executive, said that drones are not just for military use, and showed examples of drones being used to help fight fires and monitor wildlife. “These types of things have very good, beneficial uses for nonmilitary applications,” he said. Bishop, who brought a retired ScanEagle military drone for display, said his company was not contracted for the testing but would be interested in locating to Southern Nevada if it became a test site. Jonathan Daniels, a University of Nevada, Las Vegas unmanned aircraft researcher and retired military pilot, said it is illegal for civil unmanned aircraft to operate in the national airspace. The FAA’s five-year testing period will create a $10 billion national industry, with 70,000 jobs in the first three years, Daniels said. With Nevada’s weather, unrestricted airspace and lack of corporate income tax, Daniels said it is the most attractive location for companies to locate. Pilots in the audience mostly asked questions about the safety and technical aspects of integrating unmanned aircraft into Boulder City airspace, and whether flights would be beginning and ending at Boulder City Municipal Airport. Many of the finer details were not available from the experts about the program, which is expected to be a public/private partnership with the state and numerous unmanned aircraft manufacturers. However, Daniels assured the group that the integration would be gradual, probably beginning with a single aircraft flying in Eldorado Valley, but eventually leading up to operations at the airport. “We’re going to minimize, to the negligible level, the impact on (general aviation),” Daniels said. The experts also did not provide a clear answer to a question from the audience about who would be piloting the drones. But according to Air National Guardsman Lt. Col. Jim Fleitz, a subject matter expert for the state, military pilots may be flying the drones. “It all depends who we are using and who we are working with,” he said. Attendees also had privacy concerns. Questions were asked about where the unmanned aircraft would be flying, and if they would be used for surveillance of residents. The experts assured the group the unmanned aircraft would not be flying over houses or used for surveillance of residents. The testing program is a non-military and nonlaw-enforcement endeavor, Daniels said. “(The test effort) is not about what sensors we can use to look at people in their houses,” he said. However, Fleitz noted that following the testing period, unmanned aircraft will use the airspace over Boulder City and the rest of the nation. “Some day (unmanned aircraft) will fly over the national airspace just like any other aircraft,” he said. Daniels said that the FAA is expected to select the test sites by July and have a final agreement in place by Dec. 31, allowing testing to begin January. The FAA has received 50 applications from 37 states, Daniels said. Former Mayor Bob Ferraro attended the meeting, and was enthusiastic about Boulder City becoming a test site for unmanned aircraft. “I like it. I think it’s great for Boulder City,” he said. However, not everyone at the meeting was supportive. The City Council approved a resolution March 26 supporting Nevada’s application to be an FAA unmanned aircraft test site. All state municipalities have been asked by the economic development office to pass such a resolution. Las Vegas City Council passed a similar resolution supporting the FAA application April 17.